Posted May 17, 2016 by - filed under Concrete Leveling. If you have sunken or settled slabs, you might be researching the best approach to repair or replace your concrete. There are a few options, three of which we’ll take a closer look at to determine which is the best fit. Each option has its pros and cons, and certain circumstances will necessitate one over the other. As such, it’s best to have a professional take a look at your settled, or settling, concrete to determine the best approach. Read below for more information about each approach! 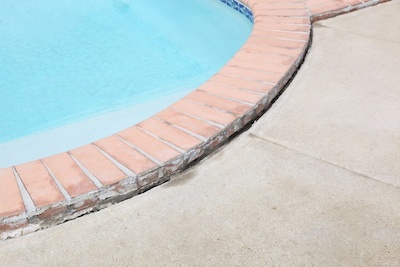 If your concrete has cracked dramatically, or deteriorated, it might make sense to replace your sunken slab. A new slab has its appeal, but a new pour will most likely not match the concrete in color or texture. A new poured concrete slab does not address the reason why the slab originally cracked. If the concrete cracked due to the weight of the slab, the problem will just happen again. Pouring concrete over soil that cant handle the weight and support the slab will not deal with the issue. Additionally, a new pour is usually the most expensive of your three options. Mud Jacking is a common term for lifting sunken or settled concrete. Mud jacking can lift a settled concrete slab by pumping a grout through the concrete and pushing it up from below. The process is sometimes called slab jacking” or “pressure grouting”. 1 to 1 5/8th inch diameter holes are drilled through the sunken concrete block/slab at strategic locations to maximize lift. A dense, finely crushed limestone aggregate (often times combined with Portland cement), is combined with water in a slurry consistency and forced into the holes. Initially the material fills any under slab voids that have been created by water erosion or soil compaction. Once the void space is filled, succeeding injections will begin the lifting process. The procedure is less disturbing then removing and replacing the slab even though both techniques require a lengthy cure period before they can be made use of. It adds extra weight to the area of repair, which can lead to further settlement if the reason for the settlement is incompetent soil that settles due to sole compaction. Lastly, since the process requires pressure, if there is a blowout, it can be difficult to clean up. 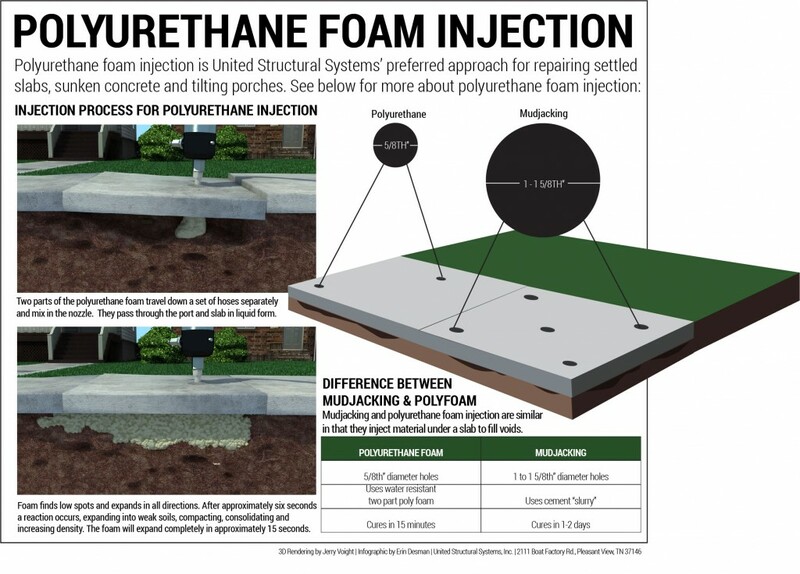 Polyurethane foam injection uses a closed cell polymer foam to lift concrete slabs. This is important because unlike an open-cell foam (e.g. a sponge) a closed-cell foam the gas pockets are sealed from each other and prevents water from being soaked up. The foam, which is a two-part poly, is injected through a hole about the size of a dime (5/8″). A port is mechanically fastened in the hole allowing for injection of the foam through and below the slab. The reaction between the two parts (an expansion of air bubbles in the foam below the slab) performs the actual lifting. The two parts of the foam travel down a set of hoses separately and mix in the nozzle. They pass through the port and slab in liquid form. One of the strongest characteristics of the expanding foams is that it takes the path of least resistance, finding the low spots and expanding in all directions. After approximately six seconds the reaction occurs. The reaction first expands into weak soils, compacting and consolidating it and increasing its density. The foam will expand completely in about 15 seconds. If any foam escapes from below the slab, it will set up quickly and plug or seal any holes that it escapes from. It cures after 15 minutes and you could drive a car on it in as little as 30 minutes. The foam will not retain moisture, is not subject to erosion and its light weight will not add significantly to the load the slab has leading to further settlement. The foam retains its shape and volume for an indefinite period reducing the likelihood of new voids forming below grade to practically zero unless the soil around the foam continues to settle or wash out. It can stain concrete if it gets on it, but the passage of time and the elements will eventually see to it. For more information about concrete leveling, call us at 615-227-2275 or contact us today!